Picking the right shovel for the job saves time—and can save your back as well. Here are a few shovels you’ll want in your gardening lineup. The classic round-point shovel has a sharp, slightly curved blade that’s perfect for digging holes and cutting into compacted soil. Square-point shovels, which often have turned-up edges, are best for scooping up loose material like mulch. 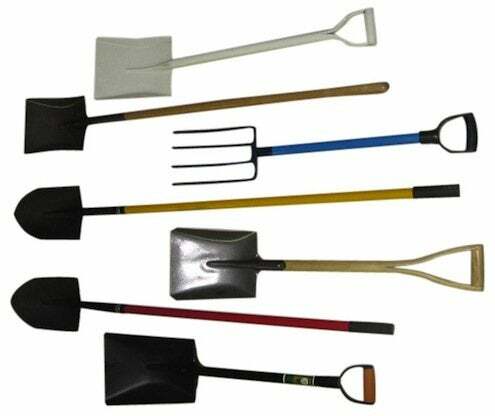 Garden spades, which have long handles and flat, square-point blades, are tailor-made for edging and breaking up clumps. Shovels come in a variety of lengths, and some have grips shaped like the letter “t” or “d.” Some people feel that a D-shaped grip gives more control in scooping and tossing, but that’s just a personal preference. Look for a strong connection between the handle and the blade, and make sure the step of the blade—the top edge where your foot rests—is wide enough for your foot, and turned or rolled for comfort.